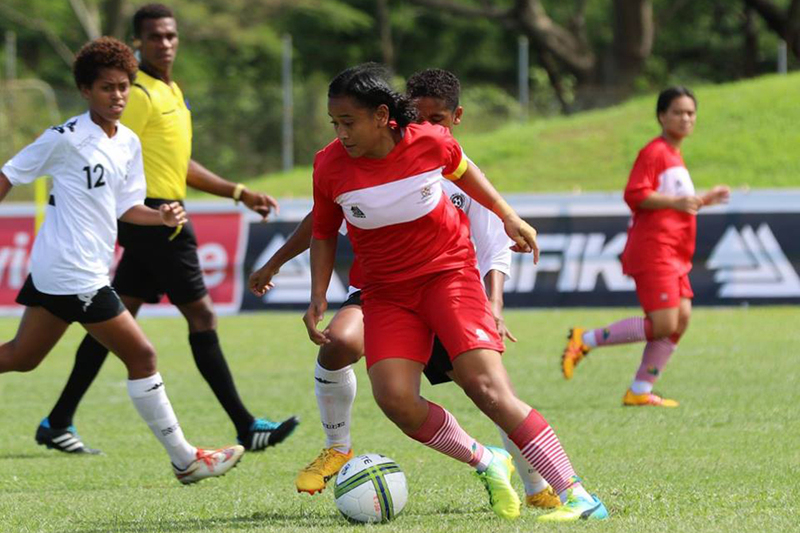 Tonga have defeated American Samoa 6-1 on the last day of action for Group B at the OFC U-16 Women’s Championship 2017. Tonga: 20. Kaloaine TOPUI (GK), 3. Mele KAFA, 6. Carmel ‘UHILA, 7. Florence HAKALO, 8. Seini LUTU (C), 9. Ana POLOVILI, 10. Lositika FEKE, 12. Kaloaine TONGA, 14. Malia OTUKOLO, 15. Ofa ATAONGO, 19. Keleni TAUKAPO. Substitutes: 1. Mele AHOMEE (RGK), 2. Ofa FISI, 4. Patricia LIKILIKI, 5. Siunipa TALASINGA, 11. Taipaleti VAI, 13. Mele TU’ITAVUKI, 16. Luseane AKOLO, 17. Mafi PASIKALA, 18. Mele AHO. American Samoa: 23. Zena FOMA’I (GK), 2. Maricar PARUNGO, 4. Jane FAUMUINA, 5. Princess FEGAUIA’I, 6. Aileen IEREMIA, 8. Diedra STEFFANY, 9. Blanche HERRERA, 10. Elcy NAOLAVOA (C), 11. Oloataua TOFAEONO, 13. Lima MAUGA, 14. Jodynn LIU-KUEY. Substitutes: 1. Maraea NAUTU (RGK), 3. Nancy SATELE, 7. Mercy SEUI, 12. Agnes SIAOSI, 15. Faafeu AMISONE, 16. Olyanna TAASE, 17. Jessica SATELE, 18. Mykaela PAOLO, 19. Lourdes AFOA.